“It’s about having a level playing field,” said John Fields of the IRB referees’ panel. “Since rugby first began back in the Victorian era umpires, officials or referees have been subject to constant, and usually completely unfair, criticism. I was a top level referee for many years and it can be very tough to listen to a cacophony of whistles and jeers from players and spectators and be unable to respond at all. It’s especially difficult when you know that you’ve made the right decision.” “In future we want the referee to blow his whistle and start chuckling loudly whilst pointing at the players involved in the screw up. We’ve even come up with hand signals for referees to use. So much like how referees signal for a knock on or penalty, we have designed a set of signals to mock players for a simple mistake. Thank heavens this is a piece of satire and does not happen because referees don’t bite back. The law book says the referee must be practical and then the buzz phrase of ‘if he has played he would know’ is used. Former All Blacks boss Sir Graham Henry has revealed he thought that his side’s exit from the 2007 Rugby World Cup may have been down to match-fixing and has launched a fresh attack on� the handling of the� quarter-final defeat of his side� to France by referee Wayne Barnes. New Zealand slumped to a shock 20-18 loss at the Millennium Stadium in Cardiff five years ago and Henry has opted to rake up the disappointment in his forthcoming biography. In the book Henry has pointed the finger at Barnes and highlighted the fact that his side dominated the contest but were not awarded a single penalty in the last 60 minutes of a game that also included a questionable pass in the build-up to France’s crucial second try. Is this tirade five years later designed to drum up interest in his book? The book may say nothing of the sort, since some reports I have read appear lukewarm on the idea. An interesting comment made in a forum was, “ Why� does the book not make any comment on why the team didn’t attempt a drop goal with over 75% possession, or is it easier to blame others?”� Then what about the previous World Cup exits: specifically the 1995 food poisoning incident? If there was so much that went against them and the loss was by two points, New Zealand could have gone for a drop or two. It does seem that rugby in Sri Lanka is not alone in making headlines even taking the issue of a referee signal if it suits the argument. There were two incidents I observed recently that make one wonder where the game is heading and whether anybody is worried. As far as the organizers are concerned the statistics show a tournament has been played and that X or Y won.� There was a game where a referee penalized a player for falling over an emerging ball from a ruck which sent the coach into a tantrum, with him shouting and threatening physical violence. The excuse was that even if the law book says so the referee must be practical and then the buzz phrase of ‘if he has played he would know’ was used. In sevens it is quick ball and anything that prevents this has to be dealt with and going over or falling over is penalized. The second was in the schools under 18 ten – a –side tournament� where the organizers said that in the event of a draw in the knockout there will be a penalty shootout with� sudden death in force . No extra time was to be played. During a match which ended in a draw there was an argument with the referee that he should play extra time as per the law book. 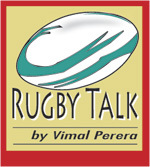 The referee went on the rules as decided by the organizers and was forced to endure the abuse� of a manger who threw the stock insult, “What rugby have you played?” at him, not knowing that he was a Sri Lanka player and being also clueless about the ability of a match organizer to have domestic variations . Some argue for the sake of arguing simply not knowing what they don’t know. On the other hand the manager should read the tournament rules and also read the clause concerning the decisions of the tournament organizers. When homework is not done the easy thing to do is argue and intimidate the referee. In both cases the match organizers sit on a high pedestal watching the unacceptable behaviour while the referee faces the wrath of officials involved with teams.